What would have been plain old Tantor, the elephant, in the Tarzan Series has here through the magic of ERB’s process of cut and splicing become a gantor, in fact a pair of them, marching along in tandem with their howdahs, wearing red and green blankets with a modern city of skyscrapers in the background. It’s a great idea for a book cover, and JCB fully reveals his usual great style in illustrating his father’s strange beast collages. 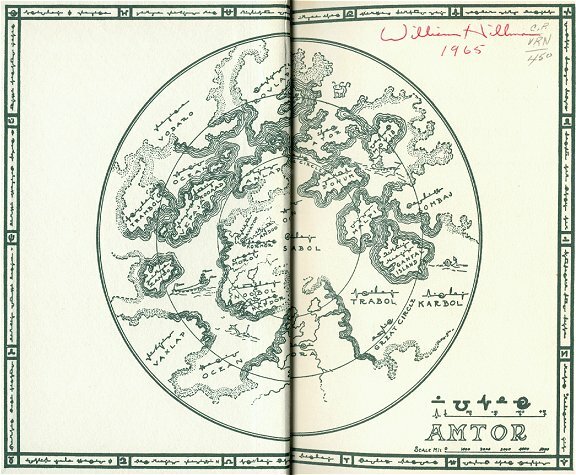 A gantor, in ERB’s own words, was an “animal larger than an African elephant and had legs very similar to those of that animal, but here the likeness ceased. 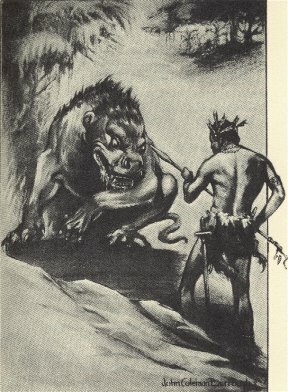 The head was bull-like and armed with a stout horn about a foot long that grew out of the center of the forehead; the mouth was large, and the powerful jaws were armed with very large teeth; the coat, back of the shoulders, was short and a light tawny yellow marked with white splotches like a pinto horse; while covering the shoulders and short neck was a heavy dark mane; the tail was like that of a bull; three enormous horny toes covered the entire bottoms of the feet, forming hoofs” (78). 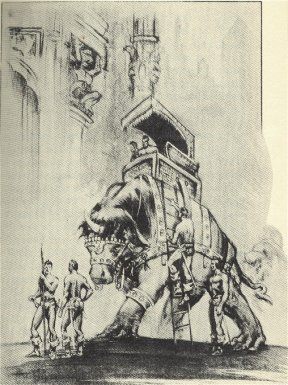 Interior Illustration #3 gives another view of the beast, this time with the ladder used to climb up into the howdah. Gantors seem to be as nice to ride as elephants, and the really nice thing is the fact that JCB chose to illustrate them as well as the more ferocious beasts that usually attract artists who want to create dramatic dust jackets. 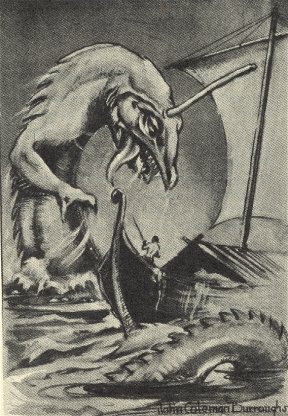 JCB does use the dramatic, thousand foot rotik, sea monster for his Frontispiece, “I saw monstrous creatures of the deep.” “It has a wide mouth and huge, protruding eyes between which a smaller eye is perched upon a cylindrical shaft some fifteen feet above its head” (286). Somehow I like his version with the Noah’s ark sail boat as well as the two Frazetta’s versions for the Ace editions. The early Frazetta has the third eye on a stalk, which is for some reason left off the later version. JCB’s rendition has an old story-book quality that is appealing, and a curl of its tail on the other side of the boat gives a greater impression of its great length than the leaping Frazettas. Lula, the Samary, faces a tharban with a pitifully inadequate spear. “About his throat were several necklaces of colored stones and beads, while armlets, bracelets, and anklets similarly fabricated adorned his limbs. His long black hair was coiled in two knots, one upon either temple; and these were ornamented with tiny, colored feathers stuck into them like arrows in a target. He carried a sword, a spear, and a hunting knife” (25). Again, JCB gets in all the details, however, the tharban should have very pointed ears, while this one’s are quite rounded. This illustration has a quaint, old-fashioned, fairy-tale quality about it. The tharban should be cast in bronze on the pedestal upon which it is already standing and sold as a piece of sculpture. I’d love a pair of them as bookends. 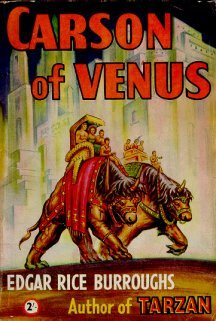 Despite his usual animal depictions -- the gantors of the cover and Illustration #3, the rotik of the frontispiece, and the tharban of Illustration #2 -- all of which could conceivable have been made for other Venus books, JCB did approach the more serious aspect of this novel, that is the parody of Nazi Germany. This more serious intent is shown in two disturbing pieces: Illustrations #4 and #6. Illustration #4 is called “Kord, Jong of Korva, sank lifeless to the floor.” It is a depiction of an assassination, or more specifically, the wanton murder of one man by another. The man with the pistol is Mephis, a thinly veiled Adolph Hitler, head of the Zani Party. He is shown firing point blank into the body of the hereditary ruler of his country. This picture like the other is very dark, almost appearing to be a scratch board work due to its mostly black surface. 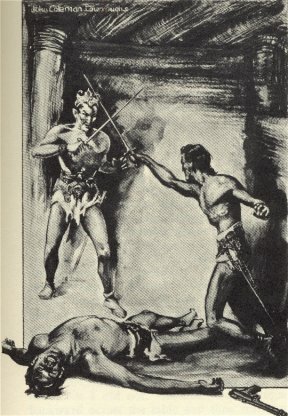 The figures are the usual almost naked bodies of ERB’s description, but the white surfaces make them as skeletal as the bones on the ground and those hanging from the hooks of the torture chamber. The primitive mask hanging above Mephis takes on an eerie Picasso-like meaning, and one gets the impression that this scene is one that became all too familiar during the holocaust. It has great power and a feeling of horror that raises this illustration to quite another level than the other pictures in the series. 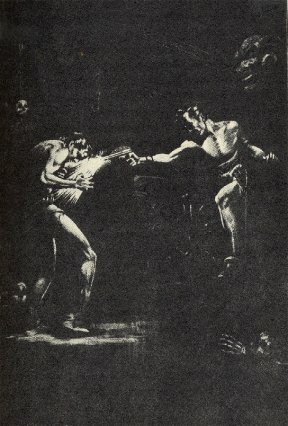 Illustration #6 called “In the palace there is a secret shaft” continues this agony in the same dark style. 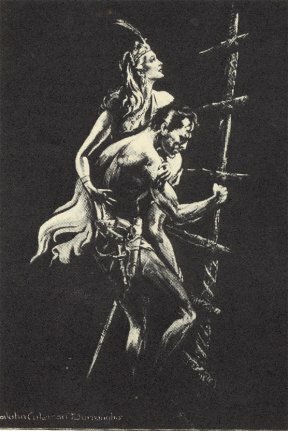 Here a man who appears to be in great pain carries a fairy tale princess down a crude wooden ladder. It is almost a descent from the cross, and like the other picture in this great series of two seems charged with symbolic meaning. One might think of it as a hero descending into hell with the last real princess of story books upon his shoulders. She is still hopeful and young, while the naked man is so burdened with his own grief that he hardly knows what he is carrying. Unlike Illustration #5, “Our blades shattered the silence of the little room,” which is an ordinary heroic fencing match by good and evil (only competently drawn) the two dark paintings have real mythic power that goes beyond the simple story told in this novel. JCB accomplished his task of illustrating this book in a masterly fashion, giving us both the quaint Burroughsian beasts and the darker side of a parody, which in retrospect was not funny at all. It was a estimable achievement for which he deserves much praise.